When I first listened to Wizard Rifle’s “Speak Loudly, Say Nothing” while looking over the accompanying cover photo for the EP, the word quirky came immediately to mind. What I was hearing was not standard fare by any means, at least not for stoner rock. 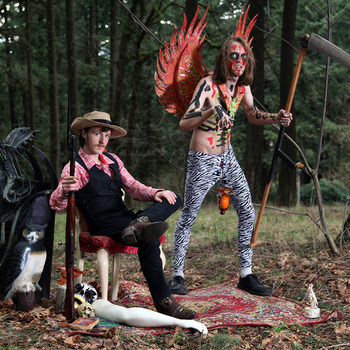 What this two piece band had done on every aspect and level of their creation was instantly recognizable as unusual, out of the norm, inordinate and unordinary, including unique and seemingly experimental songs, an apparently symbolic photo cover to their EP that consists of the pair surrounded by what ostensibly are a few choice possessions at least meaningful to them, and to the simple fact there are indeed only 2 of them making this crazy, energetic, and quirky music. My subconscious then slipped into a word association that somewhat belied Wizard Rifle’s eclectic weirdness, and that word was gifted. What they do on every second of every song demonstrates unflinching skill. The twosome consists of Drummer and Vocalist Sam Ford and Guitarist and Vocalist Max Dameron, who have pulled off the amazing feat of filling the sound envelope of each song to the bursting point using mainly just their two instruments of choice, cramming in a hard, pure, and unrelenting thrashing of those instruments in measured and evocative ways in which unbounded quality contradicts the lack of instrumental quantity. Gifted not only in how well they play the song structures, quirky interludes, and sometimes discordant segues, but also in how well they use them to create a complete, clear, and unrelenting onslaught of wonderful, thriving, stirring sound. But it doesn’t stop there. My subconscious wanted to have Wizard Rifle and “Speak Loudly, Say Nothing” all figured out in a matter of a couple of journeys through quirkville, but it was unable to do so. The dynamic duo from Portland, Oregon and their wonderful package of creations kept pulling me in deeper and deeper, engaging me in portions of songs that were sometimes not typical of standard fare and likely appreciated only by a few, and sometimes delivering more traditional structures, heavy, wonderful, full riffs and hooks, fuzzed out and soulful, reaching deep into that part way down that can only be satisfied by the muscular and methodical melodies that characterize stoner rock and all its offshoots. There is a LOT of great stuff in here, and even the portions of the songs that can’t be classified with typical melody and structure become quickly interesting and satisfying in their own right, setting the listener up for the crescendos and deliveries of quality, full on fuzz, rock at its best, quality at its highest, and pure enjoyment at its finest. This is music well worth listening to, and most decidedly worth owning. Talent and quality like this needs to remain at the fore of available stoner music, so my hope is that, like so many great bands and artists out there, Wizard Rifle hits the bullseye with listeners just as they have with their music. Listen to the opening track off the upcoming full-length release "Speak Loud Say Nothing", available from Seventh Rule March 13!!! Love the quirks! Great sound and a great read! Great review, fun read too!